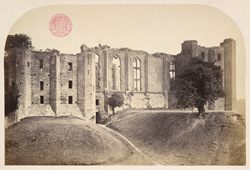 View of the 14th-century Strong Tower and Great Hall at Kenilworth Castle in Warwickshire. Founded in the 12th century, Kenilworth is the largest castle ruin in England and was one of the country's most magnificent noble residences. By the 13th century it had become a formidably fortified structure with a Norman keep encircled by a curtain wall and extensive water defences including a moat and a vast artificial lake, the Great Mere. From 1361 until 1399 it was held by John of Gaunt, the fourth son of King Edward III, who transformed the castle into a palatial medieval home. On the west side of the site he erected a complex of buildings including the stately Great Hall, and another grand chamber, the White Hall. The façade of the Great Hall, with its three enormously tall and elegant traceried windows, is in the centre of this view, with the square mass of the Strong Tower, a service block, adjoining the hall on the left and forming its north wing. The Great Hall was one of the finest 14th-century interiors in England and was finished with carved stone panels. Used for banquets and assemblies, it featured a great fireplace, a decorated doorway, and an oriel recess at the south end where the nobility would dine on a raised dais.